At 959 Yearling Way, living is easy and beautiful. This two-story home with four bedrooms and three and a half baths was built in 1996 and is 4,208 square feet. It sits on .35 acres of land and has three-car parking. This is truly a stunning home. Custom-built with gorgeous finishes, the house is brick and is surrounded by large, manicured trees and bushes. The neighborhood is just minutes away from Green Hills, Vanderbilt and downtown and steps away from Percy Warner Park. It is the perfect home in the perfect location. When you step in the two-story foyer the first detail you notice is the beautiful architecture of the staircase. It creates lines and landings, a beautiful and functional statement. The hardwood floors are stained to a light, oak shade that gleam in the natural light that filters in through its many windows. You’ll notice all the windows in the home are large, nearly reaching from floor to ceiling. Directly off the foyer is a formal dining room. Across the hall is a home office with a simple, Mid-Century inspired built-in bookshelf. The living room, kitchen and breakfast nook are all in an open floor plan, making it easy to converse with anyone in either of the rooms. The galley-style kitchen is convenient for food preparation and cooking as it has plenty of counter space and a gas cooktop. The cream-colored counters match beautifully with the cherry-brown cabinets and stainless steel appliances. There is extensive seating with the island and room for a family sized table in the breakfast nook, as well as a built-in desk next to the refrigerator. Windows line the back wall of the kitchen, giving you a perfect view of your shaded backyard. The tray ceiling adds an air of elegance to the master suite. Cozy up to your honey on cold nights, or relax alone next to the private fireplace. The bathroom has his and hers vanities, a jetted tub and a walk in shower with frosted door. Your own personal oasis waits for you in the outdoor living space. Watch the kids play on the professional tree house as you relax on the patio. 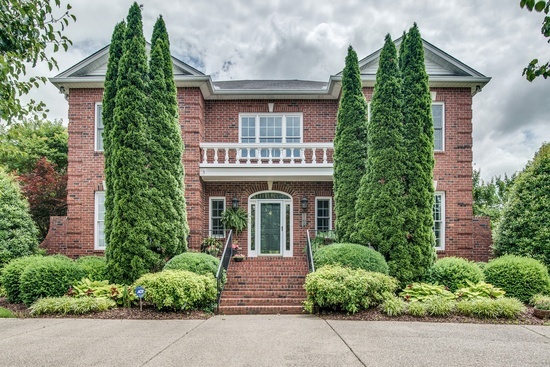 959 Yearling Way is zoned for Grassland Middle and Franklin High School and is located in the swim and tennis community of Horseshoe Bend in Williamson County — right on the edge of Nashville. It’s listed for $629,900. Paula Hinegardner with Keller Williams Realty is selling this home. Call 615-778-1818 for more information on this home.